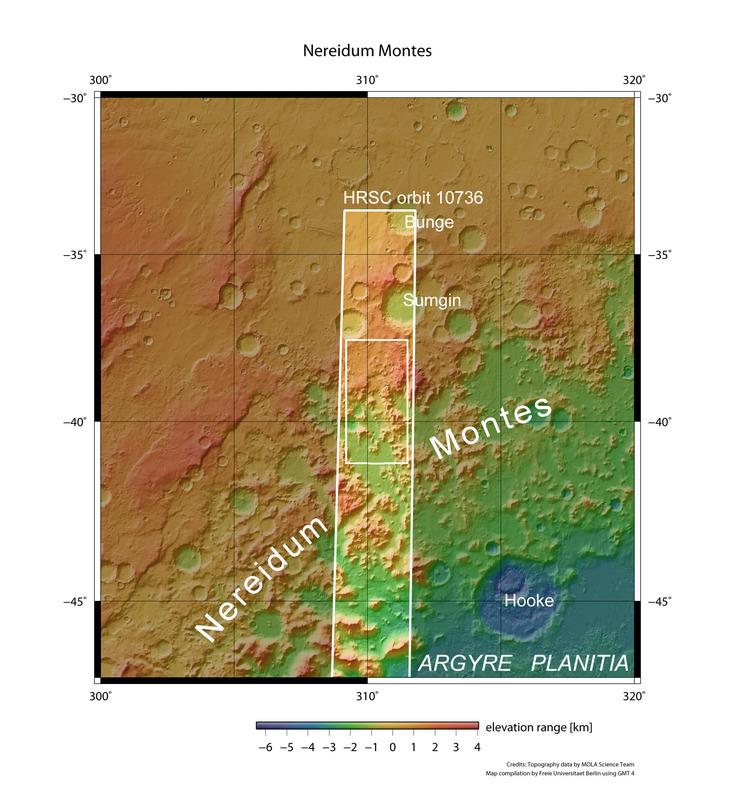 Nereidum Montes, a chain of mountains over 1000 kilometres long, is part of the northern rim of Argyre Basin, the second largest impact basin on Mars. 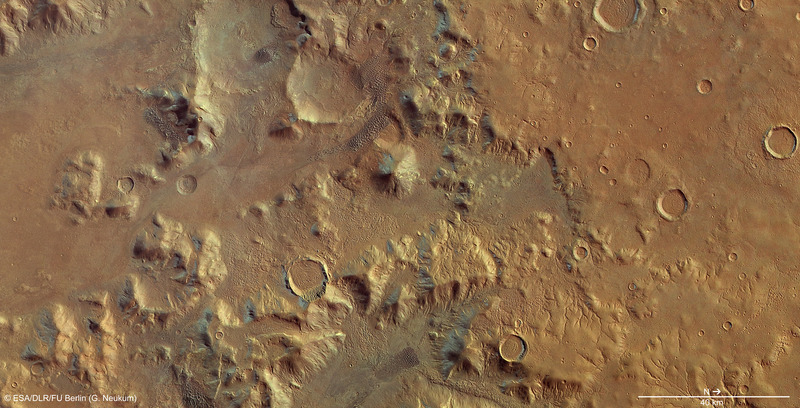 On 6 June 2012, the High Resolution Stereo Camera (HRSC) on board ESA's Mars Express spacecraft, which is operated by the German Aerospace Center (Deutsches Zentrum für Luft- und Raumfahrt; DLR), photographed a part of this mountain range. A region marked by various geological processes is revealed to the observer, where water and ice - on and beneath the surface - have left their print and, more recently, wind and weather have caused erosion. With a diameter of 1800 kilometres, Argyre Basin, the 'Silver Island', is not the common crater featuring a typical, bowl-shaped depression, but an impact basin with a complex structure. This enormous crater in the Martian crust, almost five kilometres deep today, was formed around four billion years ago, when a large asteroid struck the southern hemisphere of the planet at a speed of several tens of thousands of kilometres per hour. The ejected material was hurled into the surrounding area, creating a star-shape several hundred kilometres across. Huge blocks of the terrain then slipped from the initially unstable rim of Argyre into its interior. Impacts of this magnitude release so much energy that the rocky crust reacts plastically; the crust rebounds at the point of impact, forming a central massif in the basin and multiple concentric rings or mountainous rims are pushed up around the centre of impact. 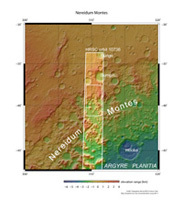 Nereidum Montes is located just inside the main ring of Argyre and forms part of the mountainous northern rim. Similar to the Alps, this range extends in an arc for over 1100 kilometres, parallel to the edge of the basin, with individual mountains of three to four thousand metres in height. Around 380 kilometres to the southwest is Hooke Crater . The images presented here show a variety of landscape features with differing origins; some caused by wind erosion and others by the movement of glaciers over the surface of Mars. 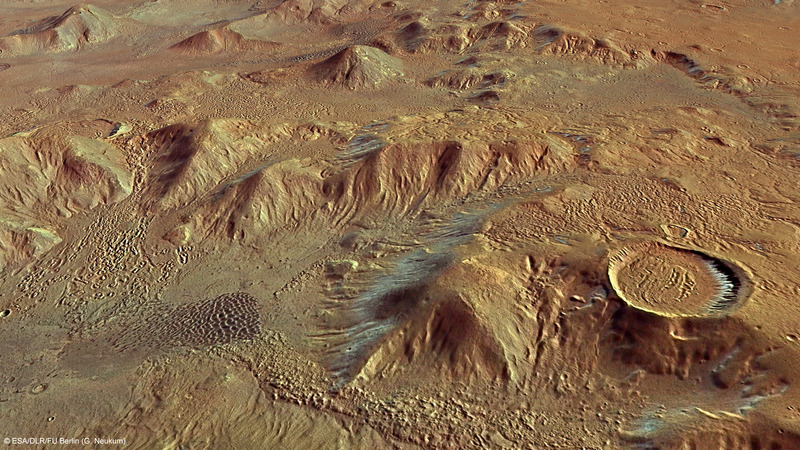 The striking network of small, dendritic valleys in the northern (right) third of the vertical plan view image is evidence that water once flowed from the rim of Argyre, across the surface and into the basin. This water originated either from rainfall in the early period of Mars' history, or from glacial meltwater. This mountainous region was named by its discoverer - Greek astronomer Eugène Michel Antoniadi (1870-1944), also known as Eugenios Antoniadis. He observed it with his telescope and subsequently described it. In Greek mythology, the Nereids were Haliad nymphs, or goddesses of the sea. Antoniadi was an important Mars astronomer. He worked out that the 'canals' on Mars, which Percival Lowell and Giovanni Schiaparelli independently claimed to have observed in 1877, were merely an optical illusion, and not waterways built by a 'superior civilisation'. To this day, amateur astronomers still use the Antoniadi Scale he devised, to determine the level of visibility during astronomical observations. Most impact craters in this region are filled with a material displaying a conspicuous concentric pattern on its surface. Structures of this type are indicative of glaciers covered in rocky debris, known as rock glaciers. The fact that this crater does not have a typical bowl-shaped profile, but is filled up nearly to the rim, could indicate that water ice remains under this dry covering of rubble and boulders; this cover would protect it from sublimation (direct transition from a solid to a gaseous state). Depending on the thickness of the covering, such a body of ice might be tens to hundreds of metres thick. A 'tongue' of this streaky material around 20 kilometres long stretches away from the largest crater in the image, at the upper edge of the left half, into lower lying regions. 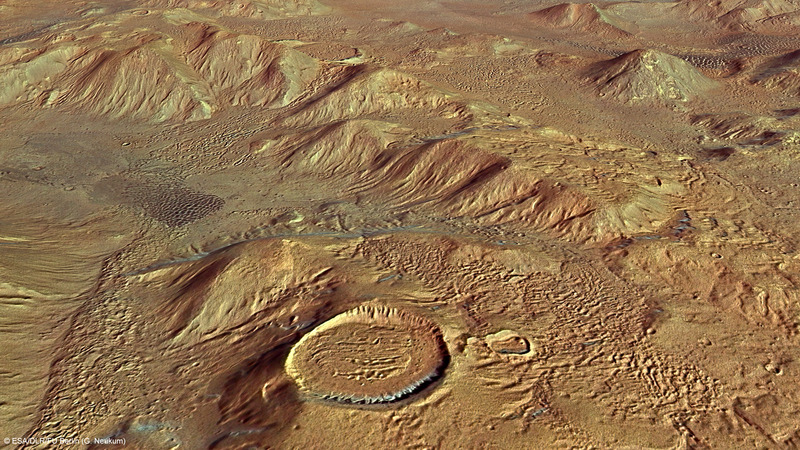 Similar structures have been discovered by HRSC at other sites on Mars, such as the famous Hourglass double crater on the western rim of Argyre. Glacial tongues with fan-shaped, partially winding, lobate rims also extend from a crater in the centre of the image. These deposits indicate the greatest extent of the rock glaciers. Water or ice may also have been present in large volumes under the surface, or might still exist there today - although this cannot be confirmed with observations from Mars orbit. On the right (northern) edge of the image, a 10-kilometre-wide crater can be seen in which rocky material ejected by the impact has taken on the properties of a liquid, due to water or ice underneath the surface of the target area, and has been deposited around the crater in a characteristic ejecta blanket. Later, in drier times following the period marked by glacial activity, the flat surfaces formed, where traces of wind erosion can be seen today. The flat surroundings into which the rock glacier tongues stretch form part of the youngest surfaces in this region. The wind has deposited dust and sand there, and numerous extensive dune fields with their characteristic ripple pattern have formed. The images were acquired by HRSC during Mars Express orbit 10,736 from an altitude of around 500 kilometres, giving an image resolution of 23 metres per pixel. The images show a section at 40 degrees south and 310 degrees east. 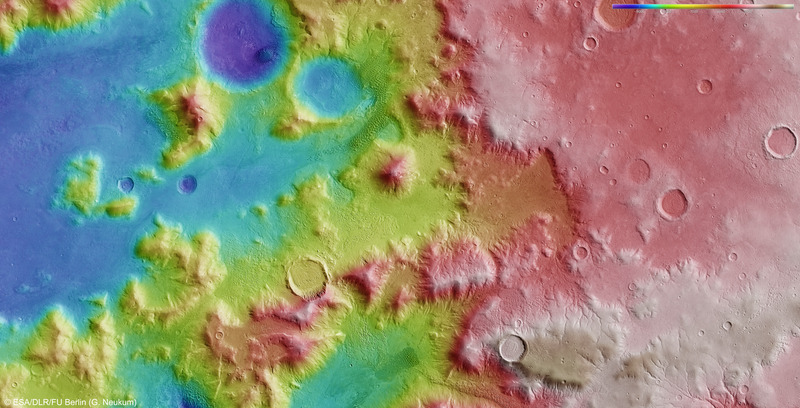 The colour plan view (4/6) was acquired using the nadir channel, which is directed vertically down onto the surface of Mars, and the colour channels of the HRSC; the perspective oblique views (1/6, 6/6) were computed from data acquired by the HRSC stereo channels. 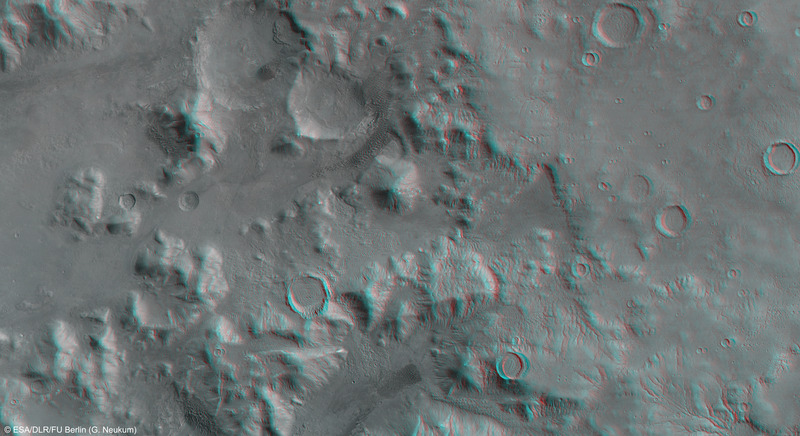 The anaglyph image (5/6), which creates a three-dimensional impression of the landscape when viewed with red/blue, was derived from the nadir channel and one stereo channel. The colour-coded view (3/6) and the context map (2/6) are based on a digital terrain model of the region, from which the topography of the landscape can be derived. The HRSC camera experiment on board the European Space Agency's Mars Express mission is headed by Principal Investigator (PI) Professor Gerhard Neukum (Freie Universität Berlin), who was also responsible for the technical design of the camera. The science team consists of 40 co-investigators from 33 institutions in 10 nations. The camera was developed at DLR under the leadership of the PI and it was built in cooperation with industrial partners EADS Astrium, Lewicki Microelectronic GmbH and Jena-Optronik GmbH. The instrument is operated by the DLR Institute of Planetary Research in Berlin-Adlershof. The systematic processing of the HRSC image data is carried out at DLR. The images shown here were created by the Institute of Geological Sciences at Freie Universität Berlin.